Earlier this year we reported on how a Professor Doris Doudet at the University of British Columbia, a noted expert on Parkinson’s disease, was facing a torrent of false allegations from the animal rights group STOP UBC Animal Research (SUBCAR), and how subsequent investigations by the BCSPCA and the Canadian Council on Animal Care fully vindicated Professor Doudet and proved that the allegations were unfounded. Needless to say all the claims that SUBCAR now displays on its Facebook page and on the two bus shelters near UBC are either false or misleading. The picture of a depressed monkey comes from a scientific paper published in 2002 in The Proceedings of the National Academy of Sciences, USA, a very highly respected journal with strict peer review-policies, and Prof. Doudet was an author on this paper, that much is true. However, the picture was not taken in Dr. Doudet’s lab or any other lab or facilities at UBC, as this research was performed at the National Institute of Health (NIH) in Bethesda, Maryland and the NIH Animal Center in Poolesville, Maryland, and was funded by NIH under the auspices and oversight of the National Institute of Child Health and Human Development and National Institute of Mental Health IACUCs . This was a collaborative effort between groups of researchers well known and respected for their behavioral, pharmacological and imaging research on primates, and established for the first time that the effect of corticotrophin releasing hormone (CRH) on the behavior of Rhesus macaques is dependent of the social context of the monkey. It may be of interest to know however that the effects of increased levels of CRH in the brain (the subject of the paper concerned) and its receptors are of ever increasing interest for their involvement in depression, anxiety and stress-disorders, and also neurodegenerative diseases such as Alzheimer’s disease. It is unclear where SUBCAR’s statement that “she wrote the guidelines on primate use and restraint for her fellow UBC researchers” comes from. UBC adheres to rules and guidelines of the Canadian Council on Animal Care (CCAC), and there are no UBC-specific rules for primates use and restraint. Professor Doudet is not part of any CCAC committees. Even if such UBC did decide to draft its guidelines on primate use and restraint for the whole University a single investigator would not be able or allowed to write them, such rules would need to be drafted by a team of researchers and veterinarians. Finally, as we mentioned at the top of this post the BSPCA investigation, and a CCAC investigation, fully vindicated Professor Doudet and proved that the allegations of cruelty made against her by SUBCAR were false. Will SUBCAR ever get their facts straight? Or are they just too accustomed to bending the truth to fit their purpose? 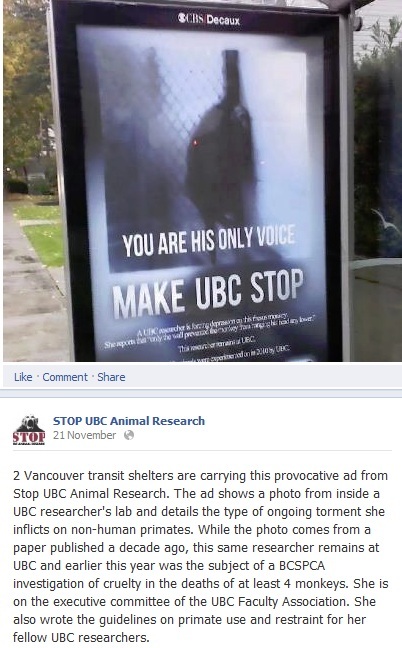 Posted on November 27, 2012 by EditorPosted in Animal Rights News, Campus Activism, NewsTagged animal rights, animal testing, Doudet, SUBCAR, UBC, University of British Colombia. I don’t recall “facts” being of particular interest to these types of groups. “Perception is reality” seems to be the guiding principle of most AR groups and if they can appeal to people’s emotions and paint the animal research in negative light then facts don’t matter. Our biggest challenge is that we can respond to these types of campaigns with the facts and reason, but the damage has been done.